I always grow more potatoes than we can eat but I get into the store and I want to try everything. This year I was only going to buy the Kennebec and I ended up adding the Lehigh Yellow but at least I stopped at 2 varieties. They don't sell them by the pound, it's either 5 or 10 lbs in a bag except for fingerlings which are in a small mesh bag which I think is 1 lb. If I could buy them by the pound I would probably try more varieties and plant one of these and one of those. I love red potatoes but they never do well for me. They develop a lot of ugly scab. Got a few fingerlings ready to plant, 12 degrees this week 60 next week, I'm holding off starting things early this year, peppers and tomatoes included. I planted mine Feb 21. Not up yet. The soil was cold, with rain, keeping it cold. I sfratched the cover, i saw sprouts almost there. This Year I bough just organic potatoes from store. They were getting ready to sprout. I didn,t want to take a chance with non organic since they are,treated with sprout inhibiting chemical. On the varilety, my experience shows that red variety do best in my location. That is what i planted." I was going to wake up an old thread on fingerlings,but figured I would just go ahead and buy what the local nursery offers.I called them yesterday and he said that he is pretty sure they will have French Fingerling like they did last year.I will also buy whatever white skinned variety they have whether Austrian Crescent, Russian Banana or LaRatte.I was in a local grocery supply store (that supplies restaurants etc),and they have 5lb bags of triple washed fingerlings (red white and blue/purple) for $6.77.Very tempted at that price,but I think I'll go with named varieties. I was lucky and found some food grade plastic 55gal drums for a giveaway price.I'm going to halve them and grow my potatoes in them.I should be able to get some reasonable production with those I should think.I guess I will find out. Like rxkieth,I would also like to try some of Tom Wagners Skagit Valley variety,but have no idea in the world how to find any to plant. "You plant a potato... you get potatoes..."
Potatoes, King of the compost pile!! Going full bore, potatoes this year! It is fun growing potatoes. We don't even eat a lot of potatoes but I love growing them. When the plants flower it tells you that the potatoes are forming and you can gently pull out a few "new" potatoes a couple of weeks after they stop flowering. It is fun to see what is going on underground. brownrexx/ thanks for the store i went up and got a few things. potatoes were 10lbs for i think $6 or 20lb for $10 50 $25. pretty impressive how big it is it was a in person. We're just doing an 18' row this year, half Red Pontiac, half Yukon Gold. 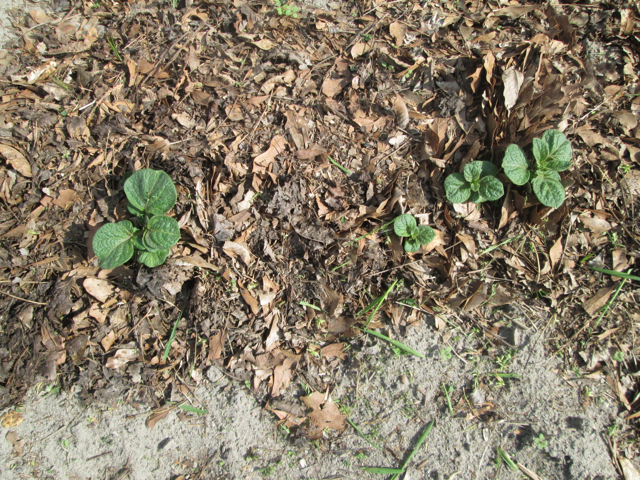 They were planted Feb 22, soil temp 50 and yesterday I noticed they're starting to pop up. Off we go! I am so glad that you liked Rohrer's. It's a fun place to visit and I get almost all of my seeds there. Here are mine. They always look so promising at this time of the year. Does anyone know if potato formation on these are related to day length? La Ratte, Rose Finn, Russian Banana, and a neighbor! Last edited by Shrinkrap; 1 Week Ago at 09:36 PM. I am really in the mood to grow some spuds this year. Got three kinds of potatoes that went sprouty while I didn't have an oven (not a fan of boiled anything). 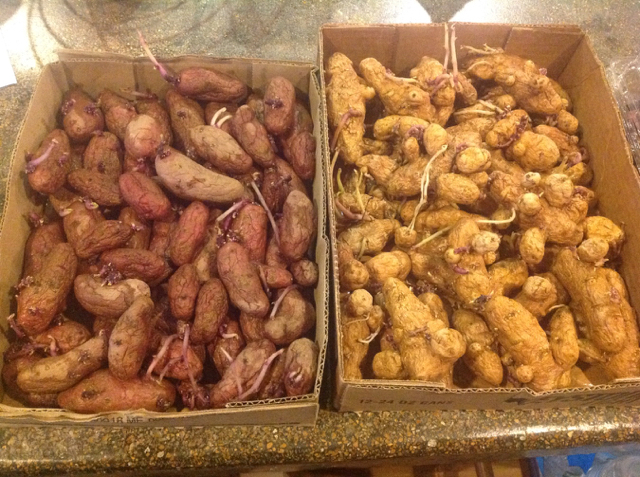 Some white fingerlings from a friend; what I think is probably Pontiac Reds from the grocery store, and another red called Goldenheart which has yellow flesh and very tasty. The fingerlings and Pontiacs have very long sprouts now, and I'm worrying about getting them planted before its too late. Even thinking about planting under row cover just to get them in the ground... anyone try that, ever? I suppose by local standards May would not be too early, although lfd is early June.